This mestizo liqueur of rum and coffee is the result of combining Santa Teresa rums, aged for two years in white American oak barrels, with a refined yet powerful coffee infusion. 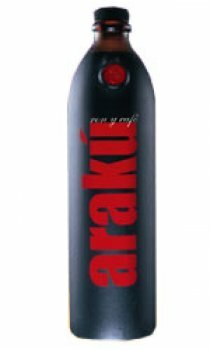 Araku takes its name from the original inhabitants of Aragua, the state where Hacienda Santa Teresa is to be visited. Fresh roasted coffee with hints of milk chocolate and aged rum fill the nose. Medium bodied and quite viscous on the entry, while hints of mocha and roasted nuts abound. Finishes with a mild coffee bitterness that adds an unexpectedly refreshing note, inviting the next sip. Serving suggestions - tremendous as a solo performer or in countless cocktails. Really smooth rich coffee flavours with a hint of chocolate but quite sweet so good over ice.